38 meter barge by Plaquet . Converted to a comfortable three bedroom home with sheltered terrace & pool plus independent crew or guest accommodation in boatmans cabin aft. On deck is the covered terrace with outdoor kitchen and access direct to heated deck pool and down via electric hatch to domestic accommodation. Inside aft is the independent boatmans cabin for guests or crew comprising bedroom with double bed 1.9m x 1.4m headroom 1.87m. WC & shower room. Up into wheelhouse then down to day space with kitchen and dinette area. Access to main living area via a door on the port side deck which descendes into the kitchen dinette. 2.43m headroom here with a full electric galley, induction hob, dishwasher, work surfaces and all the storage space you could wish for. Aft from the galley is a corridor to the utility area and finally engine room. Forward of the galley dinette and down three steps is a second lounge with an astounding 3.34m head room, TV (available by separate negotiation) book case and log stove. Forward via the corridor to port is the main shower room with electric heads. Forward again to the three double cabins. The first has 2.2m headroom and a 2 x 1.4m double bed. The second has 2.25m headroom and a 2 x 1.4m bed. The last cabin is presently set up as a children's room and has 2.3m headroom and a 1.75 x 0.9m single bed. From the lower saloon we also access the terrace deck via quarter turn wooden stairs. The terrace deck has wooden flooring and outdoor "galley" with gas BBQ (the only gas onboard (although all pipe work is in place and able to be reinstated should a new owner wish to do so). The pool is heated and has a cover to retain heat when not in use. Live aboard barge for sale in France. 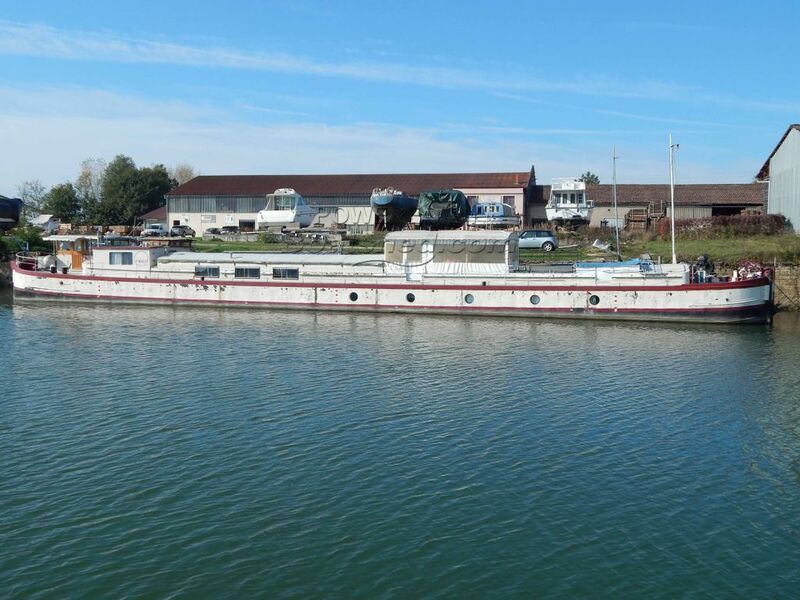 Boatshed Bourgogne is pleased to offer a 38m residential barge for sale presently located in Burgundy. Well motorised and with a folding wheelhouse that reduces the air draught to just 2.70 this will make as comfortable a cruising home as a pied-à-terre in France. Three main cabins in the main accommodation area great outdoor entertaining space and heated pool plus independent crew or guest accommodation make this an interesting opportunity. Sold with a professional exterior repaint (planned for June 2017) included in the asking price and Certificat Communautaire (TRIWV) valid to 5th July 2019 . For more information and appointments to view, please contact Graham WHARMBY, your Boatshed broker at Boatshed Bourgogne. This Barge Conversion Live Aboard Barge With Pool has been personally photographed and viewed by Graham WHARMBY of Boatshed Bourgogne. Click here for contact details.